Background: New treatment modalities are needed to improve the aerobic capacity of patients with chronic heart failure (CHF) considering the increasing disease prevalence. 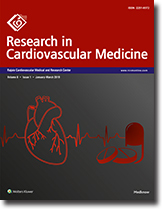 This study was done to evaluate the effect of heart failure reversal therapy (HFRT) on exercise indices, namely VO2 max and metabolic equivalents (METs). Methodology: This retrospective study screened data of 147 patients who had visited Madhavbaug Clinics between July 2018 and December 2018. The mean VO2 max and METs on day 30 of HFRT initiation was compared with that at baseline. Regression analysis was used to calculate the odds for increase in VO2 max and METs by HFRT, in specific comorbidity. Results: Of the 64 patients who fit the study criteria, majority were males (n = 51) with mean age of 57.89 ± 8.14 years. The most common comorbidity was hypertension (n = 45) followed by diabetes mellitus (n = 36) and coronary artery disease (n = 27). Mean VO2 max and METs increased significantly at day 30 of HFRT initiation compared to the mean values on day 1 (P < 0.05). Odds for elevation in VO2 max and METs were maximum in patients with myocardial infarction (MI) (VO2 max: odds ratio [OR] = 4.95; confidence interval [CI] = 0.26–91.5. METs: OR = 3.46; CI = 0.18–65.54), ischemic heart disease (IHD) (VO2 max: OR = 2.85; CI = 0.32–24.7. METs: OR = 1.67; CI = 0.18–15.29), or obesity (VO2 max: OR = 2.57; CI = 0.29–22.4. METs: OR = 1.5; CI = 0.16–13.78). All odds were statistically insignificant (P > 0.05). Conclusion: HFRT leads to significant increase in the VO2 max and METs in CHF patients, indicating improved aerobic capacity. Odds for increased exercise indices with HFRT were maximum in CHF patients suffering from MI, IHD, and obesity. Background: Standards play an important role in representing the minimum favorable and acceptable performance and are used in determining the exact current status of a hospital and evaluating and monitoring its performances. Standards also play an important role in providing quality services by perfusionists to patients undergoing open heart surgery with heart–lung machine. Objectives: This study aimed to analyze the compliance with standards related to perfusionists in Iran by comparison with the American Society of Extracorporeal Technology Standards. 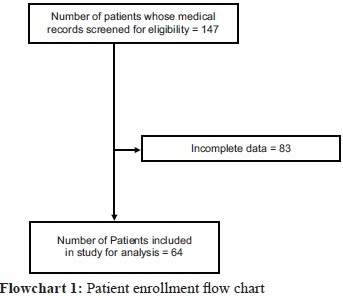 Methods: In this descriptive cross-sectional study, a questionnaire developed by the American Society of Extracorporeal Technology Standards was used to collect data from 48 Iranian hospitals and educational medical centers. The level of compliance with perfusion standards related to perfusionists was analyzed and compared with the American Society of Extracorporeal Technology Standards. Results: The results showed that 45.52% of the centers were in compliance with factors related to standards of competence, qualification, and backup staffing for critical situation. Only 23% of the centers comply with standards of perfusionists' interaction with the medical team which indicates an unsatisfactory interaction between perfusionists and the medical team, and regarding the working hours, only 18.5% of the centers comply with the standards in this area. Conclusion: The comparison made between the compliance of Iranian perfusionists and the American Society of Extracorporeal Technology Standards reveals an unsatisfactory level. This suggests the need for the development of accreditation programs and standards of care on the one hand and conduction of a continuous evaluation of these standards on the other hand. Background: Refractory recurrent ventricular tachycardia is a difficult therapeutic problem. There are implantable cardioverter-defibrillator (ICD) patients with amiodarone-refractory of ventricular arrhythmia (VA) who are not eligible for catheter ablation. The aim of this cohort study was to assess the efficacy of mexiletine in combination with amiodarone in the reduction of VA in this group of patients. Methods: This was a retrospective study of all consecutive ICD patients who were treated by adding mexiletine to amiodarone in refractory electrical storm or frequent VA episodes. The enrolled patients were ineligible for catheter ablation. Results: Thirty-seven patients (32 males; mean age, 57 ± 14 years; range, 26–81 years) were studied. Adding mexiletine to amiodarone had no significant effect on QRS width, QTc interval, and PR interval (all P > 0.05). We observed a significant decrease in the number of total ICD shock and significant increase in appropriate antitachycardia pacing during follow-up after initiating mexiletine. Mexiletine therapy also significantly reduced the amiodarone dose during the follow-up. No mortality was observed in the present cohort during the study period. Conclusions: Mexiletine, when added in case of amiodarone failure, reduces VA episodes and appropriate therapies in patients with an implantable cardioverter defibrillator. Background: Pericardial effusion may culminate in cardiac tamponade which could be fatal. This study aims to describe the prevalence of cardiac tamponade, with the etiology, and outcome of childhood pericardial effusion at Aminu Kano Teaching Hospital, Kano, Nigeria. 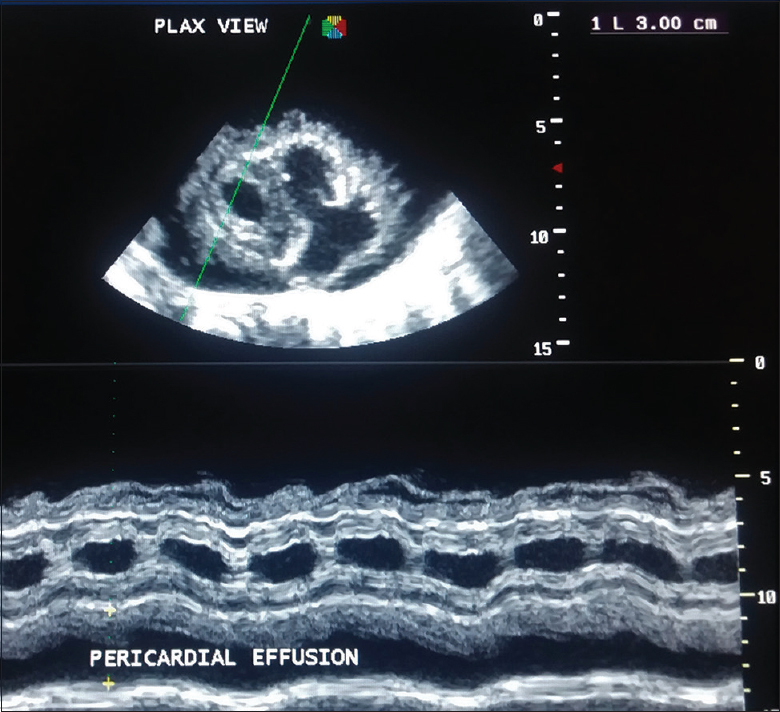 Materials and Methods: Hospital records of children with pericardial effusion were retrospectively analyzed from June 2016 to May 2018. Data were described via percentages, tables, and bar and pie charts. Results: Of the 5876 pediatric admissions during the study duration, 10 (0.2%) children presented with cardiac tamponade (9 boys and 1 girl) and had emergency echocardiography-guided percutaneous pericardiocentesis; 5 (50%) of them had purulent, 4 (40%) had serous, and 1 (10%) had hemorrhagic pericardial effusion. Seventeen children, aged 8 months to 13 years with a male: female ratio of 2.4:1, had pericardial effusion during the study period. Pericardial effusion of infectious origin (58.8%) was the most common followed by uremic (17.4%), rheumatic (11.8%), and trauma and idiopathic (5.9%). Tuberculosis (TB) was the most implicated cause of infectious pericardial effusion (70%), and also the most common cause of cardiac tamponade (50%). Mortality was recorded in two children (11.8%) with end-stage renal disease and decompensated rheumatic heart disease, both complicated by pericardial effusion. None of them were in tamponade and hence did not have pericardiocentesis. Emergency echocardiography-guided percutaneous pericardiocentesis was safe and successful in all those who had this procedure. Conclusion: Cardiac tamponade is common in children with pericardial effusion in Kano. TB is the leading cause of childhood pericardial effusion and cardiac tamponade. Mortality was reported in two children, with pericardial effusion of uremic and rheumatic etiology each. Context: The 6-minute walk test (6-MWT) has been commonly used to assess patients after open heart surgery. However, due to some situations, where patients could not perform the test for the duration of 6-minutes, a short walking distance test has been utilized to test the patients (i.e., 5-meter walk distance: 5-MWD). However, little is known whether fixed duration walking test, or fixed-distance walking test, regarding to the prediction of duration of hospital admission. Aims: The aim of the study was to evaluate the 6-MWT and 5-MWD in patients who had undergone open heart surgery, in order to predict hospital admission. Settings and Design: A prospective cohort study was designed at Thammasat University Hospital, Thailand. Methods and Material: Fifty-seven participants, who had open heart surgery were recruited and were asked to perform 6-MWT and 5-MWD pre and post-operative heart operation. Statistical Analysis Used: Regression analysis was used to test the prediction of the length of hospital admission and the walking performance.Results: A regression analyses indicated that after adjustment for age and gender, baseline 5-MWD and 6-MWT were associated with increased the hospital admission (ΔR2 = 0.112 and ΔR2 = 0.068, respectively). Conclusions: The 5-MWD might be an alternative to predict the length of hospital admission in patients who had undergone open heart surgery. Objectives: In the present study, we sought to assess the changes in functional, biochemical, and echocardiographic measurements of heart failure (HF) during a 12-week Mg2+ supplementation in chronic stable HF patients. Methods: Twenty patients with clinically stable New York Heart Association (NYHA) Class I–III systolic HF (echocardiography-derived left ventricular ejection fraction [LVEF] of <40%) and normal magnesium level (1.5–2 mg/dl) were recruited consecutively in this before and after study. The patients received oral Mg2+ (400 mg MgO b.i.d., for a total of 482.6 mg of elemental Mg2+) for a total of 12 weeks. Results: Twenty patients, including 10 (50%) men, with a mean ± standard deviation age of 53 ± 15 years were included. The 6-min walk distance significantly increased from 379 (348–440) m to 583 (506–604) m. High-sensitivity C-reactive protein significantly decreased from 12 (7–14) to 3 (2–4) mg/dL (P < 0.001). N-terminal pro-brain natriuretic peptide also declined from 653 (415–2660.75) to 189.5 (82.5–537.75) ng/dL (P < 0.001). The LVEF and systolic pulmonary artery pressure significantly improved (both P < 0.001). Conclusion: We demonstrated beneficial effects of Mg2+ supplementation in patients with normal magnesium level. We suggest routine Mg2+ supplementation to all HF patients with low-to-normal Mg2+ levels and normal kidney function. Background: It has been shown recently that a considerable burden of pulmonary embolism (PE) roots from an inflammatory response. The activated inflammatory cascade will be responsible for the final fibrotic response of pulmonary vascular bed, creating further mechanical obstruction which results in subsequent right ventricular (RV) dysfunction, influencing functional capacity and future prognosis. Although anticoagulants represent the cornerstone treatment of PE, the drug class has a minimal effect on the mentioned pathology. 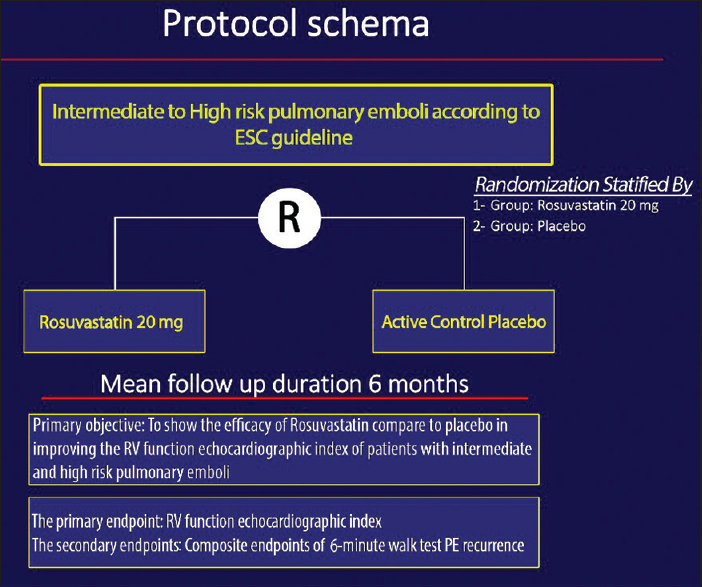 Study Design: The present study is a single-center randomized, double-blind, parallel group controlled trial with placebo which will evaluate the effect of high-intensity statin – rosuvastatin 20 mg daily on patients with intermediate-to-high-risk PE. Study population will be selected from patients for whom statin is not otherwise indicated. Primary end point of the present trial will be echocardiographic measures of RV function. We believe that the mentioned indexes represent an accurate surrogate for the functional capacity and prognosis. Our secondary end point will be the composites of PE recurrence and exertional capacity measured by 6-minute walk test. Conclusions: The result of the present trial might influence the complimentary treatment of acute PE. Objectives: this study aimed to assess the effects of percutaneous coronary intervention (PCI) on regional and global left ventricular (LV) functions (systolic and diastolic) in patients with coronary artery disease (CAD) using tissue Doppler strain rate (SR) imaging. Patients and Methods: in this study, we randomly assigned 100 Egyptian adult symptomatic patients with CAD that underwent coronary angiography and candidate for PCI on the left anterior descending artery. LV early diastolic and systolic SR were measured 24 h before and 48 h after PCI. Results: Most of the LV diastolic and systolic parameters (A, E', E/A, E/E', and isovolumic relaxation time [IVRT]) showed significant difference before and after elective PCI, while mitral E velocity, DT, and pulmonary vein flow before and after PCI did not show significant difference. SR imaging findings showed high significant difference mean peak systolic and mean early diastolic SR of ischemic regions after PCI; mean early diastolic SR before PCI was 1.86 ± 0.13 while after PCI was 2.57 ± 0.18 (P < 0.001) and mean peak systolic SR before PCI was 0.65 ± 0.18 while after PCI was 0.901 ± 0.15 (P < 0.001). Conclusion: Most of the LV diastolic and systolic parameters (A, E', E/A, E/E', and IVRT) improved after PCI in CAD patients. Furthermore, regional myocardial function as measured by mean peak systolic and mean early diastolic SR in the ischemic segments improved significantly compared with that in nonischemic segments.